So, the SKY CITY Breakers entered the play-offs with little winning momentum having lost four of their last six regular season games. Two of those losses were at home against eventual play-off opposition Adelaide and Cairns. So much for the theory of momentum as the Adelaide 36ers were swept 2-0 and the Cairns Taipans were given the same treatment. 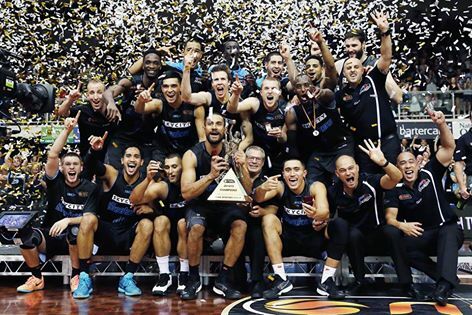 5 The number of NBL titles won by Mika Vukona in the last 7 years. His first title was with South Dragons in 2009. We all know what has happened since. 5 The number of times the Taipans had beaten the Breakers in the last 6 meetings prior to the Grand Final series. 7 The number of opposition courts on which victories were recorded in the season. The first season that the Breakers had beaten every opponent on their own court in the regular season. 9 The number of consecutive play-off victories recorded by the Breakers. Last defeat was Grand Final Game 2, 87-86 in Perth in April 2012. 10 The number of consecutive games Adelaide had won prior to the semi-final series. The Breakers won by 29 and 11. 22 The record number of play-off games played for the Breakers by Vukona and Abercrombie. 47.1 Tom Abercrombie’s 3 Points %, shooting 49 from 104 attempts. Second in the NBL. In addition Corey Webster shot a very handy 42% (71/169), 5th in NBL. 59.6 Ekene Ibekwe’s shooting %, he led the NBL in Field Goal % – 152 from 255. Interestingly Alex Pledger was second in the League on 56.4%. 150 Alex Pledger played his 150th game for the Breakers in Grand Final game 2. 193 Cedric Jackson led the NBL in assists dishing them off at 6.0 per game. 4,095 The crowd for Grand Final Game 2 at North Shore Events Centre. The noise following Ibekwe’s game winning fade away winner sounded more like 14,000.